I’m rather busy at the moment (things to do, people to see, you know how it is), so after finishing Cloud Atlas, I decided to take it easy and not plunge straight into another long book which might take me a long time to finish. As you may have noticed, my preference is for long, involved novels, so short stories are not really my thing (I find them a little frustrating at times, to tell the truth). However, there is something more frustrating than a short story, and that’s an unfinished short story – and that’s where we’ll start today. You may have read my first and second reviews of Katherine Mansfield’s Collected Stories, and this week I finally managed to polish off the last parts of the monster, consisting of her last (posthumously) published collection, The Doves Nest and Other Stories, plus a bunch of fragments which remained incomplete at the time of her death. Again, there were some lovely pieces; I particularly liked The Doll’s House, a moving story involving Kezia and her family (the stars of a couple of earlier stories), and A Cup of Tea, an interesting tale of a random act of kindness between social classes. However, once through the few complete stories and into the fragments, I just lost it. I simply couldn’t engage with four pages of build up towards a denouement which had never been written and never will. I’m sure academics specialising in Mansfield find these morsels fascinating; I was just glad to get them out of the way. I know. It’s my own fault. Short stories aren’t meant to be devoured by the plateful, and I have behaved like a little boy at a wedding, stealing a plateful of fairy cakes and stuffing them all into my mouth as quickly as possible (before regurgitating them outside the toilets). There were some amazing stories in the collection, but there were also several weaker efforts, and the problem with reading them in such a large bundle is that they blur into one big mess after a while. I promise that the collection will be revisited at some point: one. book. at. a. time. When I was a teenager, Neverwhere, a short series written by Neil Gaiman, was shown on the BBC, but it was one of those things I never got around to watching. Even though I read Good Omens, Gaiman’s collaboration with Terry Pratchett, I had somehow neglected to read any of his books until now (which is strange because: a) I’ve read plenty of Pratchett books in my time and b) I loved the concept behind Neverwhere). Finally, this week, I got around to reading the book behind the show, and pretty damn entertaining it was too. It’s a marvellous read, reminiscent (naturally) of Pratchett but slightly more measured and less frantic (I often feel that a Discworld novel rushes you through it as if it has somewhere else to be, and you’re holding it up). It does have the feel of an adaptation – a lot of ‘scenes’ and not as much characterisation or description as one might have hoped -, but it does have some interesting twists and turns which most readers will be fairly surprised by. Of course, like many people, I was most amused by the twists on the city above. Richard encounters such people as the Black Friars, Old Bailey, the Angel Islington and Lady Serpentine (one of the Seven Sisters) and visits both the Earl’s Court and (K)Night’s Bridge. Believe me, after reading this book, you’ll never look at a tube map the same way again. You see, Claire’s past is anything but happy, and Alfred’s is anything but as flawless as people think. Woman, scorned, revenge, dish, cold, laugh, last longest… Cliches are wonderful, but this is no joke; when the richest woman in the world wants something, she is used to getting it. The Gülleners close ranks initially, the mayor declining her offer amid loud cheers from the citizens of Güllen, but Claire’s ominous reply “Ich warte” (“I’ll wait”), hints that this may not be the final answer, as much as the townspeople believe that they stand behind Ill. The crux of the story is temptation, personified in the figure of the old, seemingly unkillable, Zachanassian. The artificial limbs fitted after numerous crashes and air disasters (of which she was always the only survivor) serve to make her seem more sinister and inhuman, a hideous goddess straight out of a Greek play. The townspeople, despite professing to support Ill, mysteriously begin to appear richer, buying new clothes, drinking more expensive beer, smoking more refined cigars – all on credit. It becomes clear that they are all speculating that someone may just take up Claire’s offer, and Ill quickly begins to fear for his life. While denial is rife, the more responsible members of the community do let their facade crack at times: the priest begs Ill to flee; the teacher threatens to make the truth known to the outside world in a drunken rant; the mayor and the policeman visit Claire to beg her to change her mind. All to no avail. It sounds very dark, but it’s actually just as much of a farce as a tragedy. The stage directions are absurd, as is Dürrenmatt’s wont, with actors pretending to be trees, and four chairs serving as a car. Claire is a monster and brings a bizarre court with her, including a couple of muscly ex-con stretcher bearers and two blind eunuchs who speak in unison (not to mention the three husbands she goes through whilst in Güllen, all to be played by the same actor). When it comes to the crunch though, the writer knows how to pare away the comedic elements and leave a stark truth facing the protagonists: either Ill’s body is placed in the coffin the old lady has brought with her, and taken away to buried in Capri, or he lives, Claire leaves, and Güllen rots in poverty. We all suspect we know the outcome, but it is still painful to watch. In another work, the writer talks of his Swiss countrymen as being “spared and not tempted”, a response to Swiss moral superiority over the actions of Germans in World War II. Here, we see what it is to be tempted and hope fervently that it never happens to us. I love Neil Gaiman! Yay! American Gods is my favorite. 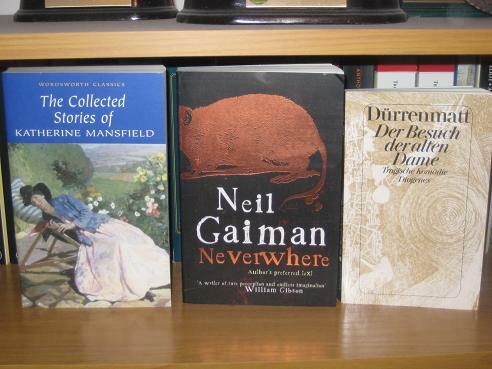 I'm planning to order a copy of 'American Gods' soon, and I'm currently telepathically imploring Mr. Gaiman to write a sequel to 'Neverwhere' – if ever a book needed a sequel, this is it! American Gods is my favourite too! But I loved Neverwhere because it made me see London in a different way. I've heard many good things about Katherine Mansfield, but I agree with you that reading too many short stories in one go can be very tiring for the brain as well as the eyes. And it's such a doorstopper of a book!